« First Look & FREE Chapters from My New Book! So instead of rushing into friendship with a backpack full of sky high expectations, it’s worth taking the time to pause and decide what we’re not going to do this time around. 1. Assuming a friend can be all things at all times to us. If we are constantly disappointed by how our friends don’t live up to our need for encouragement, the problem might be that we’re expecting the kind of soul validation they’re not equipped to give. The kind of soul validation that one person who may have had a bad Monday and already feels stressed by her kids or her looming work deadline can’t possibly provide. Instead, we need to bring our identity to our friendships rather than try and take our identity and validation from our friendships. Entering friendships firmly rooted in our faith, our family, and our identity is the healthiest way to start any new friendship. 2. Forgetting that we all bring baggage into friendships. Whether we like it or not, we all haul some kind of baggage with us into our adult friendships. And we all need to be reminded that we’re not responsible for the luggage that other women will bring with them. But that we will be impacted by it and should be ready for when those suitcases of junk inevitably explode at inconvenient times when all you thought you were doing was making plans for a kids play date and instead you end up down a dark and twisting conversation you never expected. At the end of the day, it’s not your job to fix your friends. It’s your job to love them, while maintaining healthy boundaries that serve you both. 3. Setting unrealistic expectations for a friendship. We can’t connect when we’re setting all the terms. So it’s essential we identify the often-unrealistic expectations we bring into friendships – and how those can disappoint us before we’ve even begun. We must sacrifice our long lists of wants, demands, and expectations. We must lay them down and be willing to have them completely upended. Crumpled. Rearranged. Messed up. The best friendships don’t try to squeeze you into that uncomfortable pair of skinny jeans, the best friendships let go their expectations and fit you like your comfy, ratty Sunday afternoon jeans with plenty of room to breathe. 5. Worrying about what our friends will think of us instead of trusting them with who we really are. Because it isn’t. Because friendship shouldn’t equal entertaining. No, friendship should look more like yoga pants – comfortable, old, worn in, and stained. I think we can do it. I think it’s easier than we think. But it starts with our willingness to open the door whether we’re prepared or not. It starts with admitting that our quest for perfection is a gift to no one. Real friendship will insist on getting past that front door of perfection until it finds that closet or drawer that’s stuffed full of our junk and it will insist on opening it. Dear friends, we come to friendship admitting our flaws and lowering our defenses not because we’re promised we’ll never get hurt again. We do it surrendered to the truth that even though friendship might hurt us, we are called to love other people. So we bravely, vulnerably, deliberately choose to do so. Just like our Jesus showed us how to do. 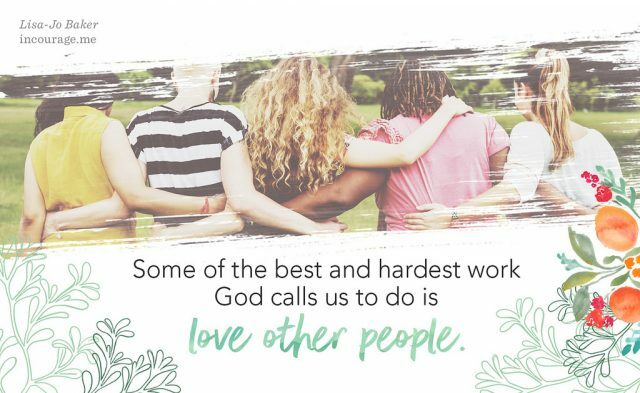 Some of the best and hardest work God calls us to do is to love other people. One day, one woman, one misstep at a time. We take the time to figure out friendship not because it is easy. But because it is necessary. Question for you: What would you add to this list — what are the mistakes we can help each other avoid as we head into new friendships? I’d love to learn more from your own experiences in the comments today. 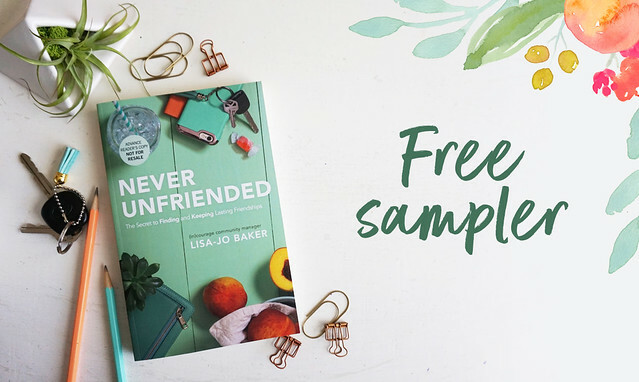 Did you get your Free Sampler of Never Unfriended yet? This is our new book that releases April 4. But we wanted to get chapters into your hands early! It unpacks the secret to finding and keeping lasting friendships. Great list. Friendships are never uncomplicated, but they are so worth it. Friendship is HUGE for me. I give my all, but I am saddened when I feel a friend needs to compete, when jealousy gets in the way, when trust is broken, when, instead of being a friend, they need to reprimand you for something vs lovingly saying something as someone who loves you vs chastising. If we’re going to chat, I had a best friend for 4 years – dear friend and a great soul connection, but something went awry in a conversation that became accusatory, defending an acquaintance over me, scolding and reprimanding verses saying it in love and compassion. I was a complete emotional mess conversing for 2 hours, asking questions as I was really trying to make sure I was understanding what I was hearing – once confirmed, I left and that was it. I had to walk away from the friendship. It was so hurtful and I’ll never really understand it. She lacked compassion while making sure to drive home her point. 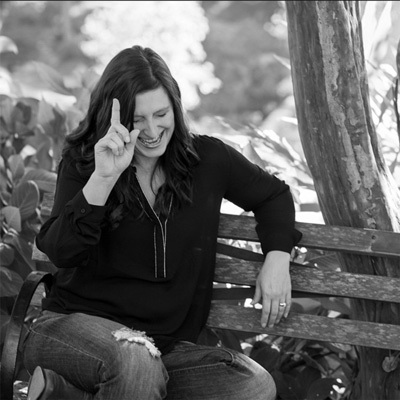 It’s hard for me to accept and understand a situation where I often think if the roles were reversed, “what would I have done?” and I wouldn’t have kept driving home my point for 2 hours or completely lacked emotion, compassion or love. Was I wrong for walking away? I don’t know, but I couldn’t honor something that, in my heart, just felt off. I’ve been thinking of hosting a girl’s gathering for weeks. I haven’t sent out the invite because my life is in a state of personal and professional disarray. I kept telling myself as soon as I figured things out with my love interest, and got the perfect job I’ve been applying for, I’d invite everyone over. Reading your post, I sent the invite this morning. Maybe by March 18th I’ll have had that heart to heart with my guy and things will turn a corner. Maybe by March 18th I’ll have heard back from the dream job company I applied to. And maybe not. But, I sent this today because your post reminded me: We need to trust that who we are is the woman available, and she is enough. Real friendship is openness and what you see is what you get, not a socially correct friendship. One where I know you and you know me. It is genuine. We accept one another and are there for one another.